This is without doubt one of the most beautiful and entertaining casino brands we had the pleasure to review. Cashmio casino joined the gambling world in 2015 mainly catering to the UK and Scandinavian gambling markets. In order to do that, this casino works under strict regulation, with licenses from the UKGC and Malta Gaming Authority. Cashmio is part of the MT Secure Trade Limited group, which doesn’t have much history in the gambling business – honestly – but seems to know exactly what players want. Cashmio casino has been successfully operating for 3 years already, so we have a lot to talk about! Between other remarkable aspects of this online casino, I can mention their gamification, beautiful graphics and attention to detail. 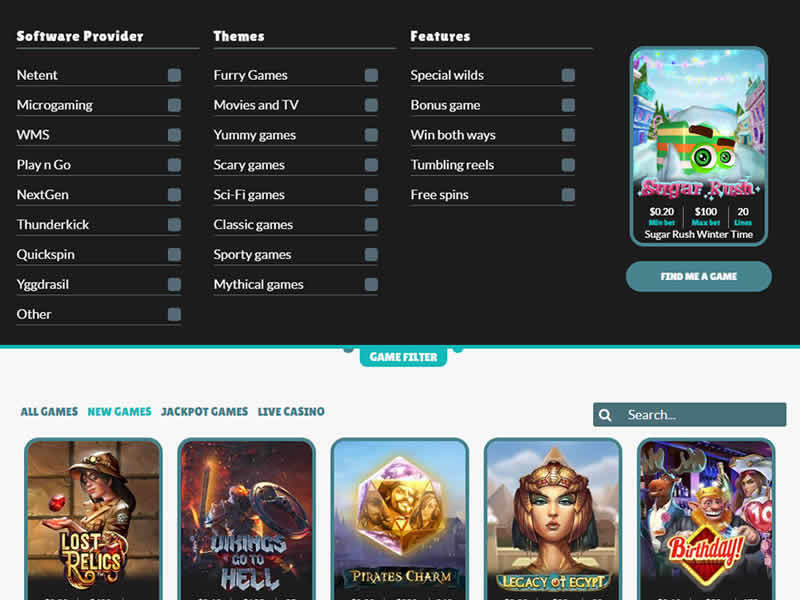 As soon as I logged to the site I found a fun platform with lots of features to improve our gaming experience. Did I mention instant withdrawals? Yes, Cashmio processes withdrawals in a matter of hours, even during weekends. On the downside, the casino doesn’t offer 24/7 support. Still, representatives are friendly and knowledgeable, so you won’t have to wait long to solve any issue that may arise. Last, but not least: Cashmio casino doesn’t accept USA nor Australian players so if you happen to be located there, don’t worry. We reviewed the best Australian casinos and top rated online casinos in USA, so feel free to visit those sections for alternative gambling sites available in your region. * 18+. Terms and Conditions apply. Promotion restricted to certain countries. One of the strongest points at Cashmio is their banking system. Any withdrawal request is processed within 24 hours or even in a couple of minutes, depending on the payment method you chose and it’s inherent speed. There are many options to cash out your casino earnings, but many of them are not available in some regions. Paysafecard is also available for withdrawals, but with low limits. Overall cash out limits are good, set at: £/€ 50,000 per month, which is more than enough for most players. In the Terms and Conditions it is stated that any earnings above £ 50,000 should be paid in installments of 10% per month. Cashmio accepts the following currencies: EUR, GBP, CAD, SEK, NOK. There are plenty of bonuses waiting for you at Cashmio Casino, but some promotions are unavailable to players located in most countries. To say it properly, only players located in one of these 8 countries will have access to the free spins no deposit or the match bonus. Depending on where you are located, you may have access to some promotions and not others. For example, players located in Austria, Finland, Netherlands, New Zealand, Norway, Malta, Sweden, Switzerland can get 20 free spins no deposit required, just by signing up. There’s a max. cashout of £ 100 for the spins and wagering requirement is: 45X. While you can’t expect to get rich with this promo, it will work just fine to test the casino and see if you like it. Of course, you need to be located in one of the countries listed above. With your first deposit of £/€ 20 or more you can get a 100% match bonus up to £/€ 50 + 50 extra spins on Spinions. This bonus is only available for players located in one of the following countries: Austria, Bolivia, Canada, Colombia, Chile, Finland, Germany (excluding players residing in Schleswig-Holstein), Japan, Malta, Mexico, Netherlands, New Zealand, Norway, Paraguay, Peru, Sweden, Switzerland, United Kingdom, Venezuela. You can complete daily missions for bonus points that can be traded for free spins and other in-game coins. Some of the quests will ask you to play certain games, or wager a minimum amount of times. I really love gamified casinos because they keep you entertained hunting for more bonuses while you play different games. Wagering requirements for bonuses gained from missions and quests is 45X. The cashmios are some sort of minion / toons that will join you in your casino journey, bringing some daily quests to get additional bonuses as you go. I’m a true fan of gamified casinos and this one is not the exception. 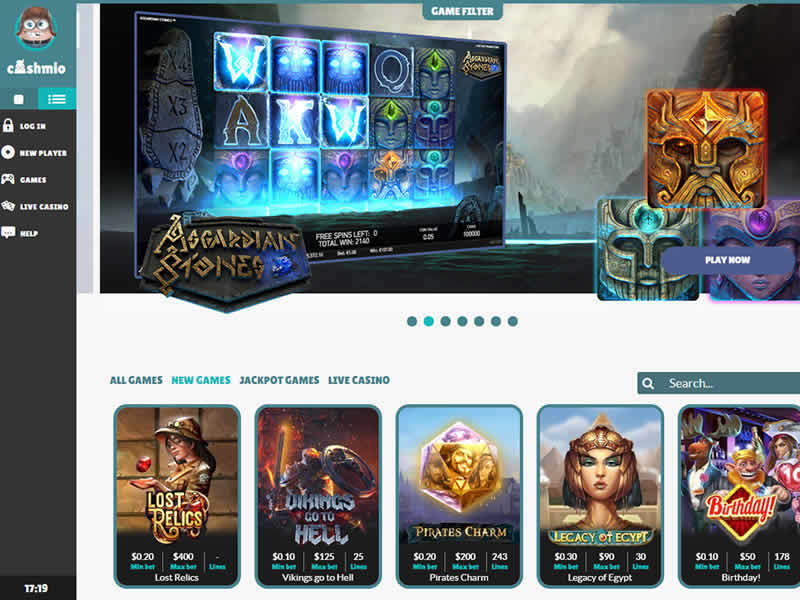 Sometimes it happens that you get bored from playing just casino games and participating in some of the quest offered at this site is not only fun, but also rewarding. 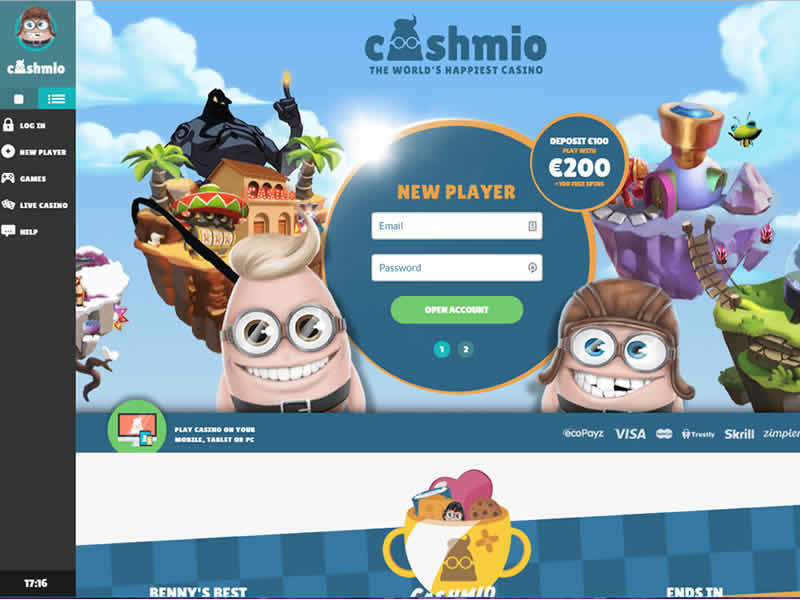 As soon as you register and verify your account at Cashmio casino, you get access to a homepage that will show you all the quests available, bonus offers together with a slider including newest games to try. There’s so much information here! New missions will appear as soon as you complete the first ones, that provide bonus points that you can exchange for free spins, cash and other in-game coins. I had a lot of fun following the quests, because it gave me more reasons to keep playing, not just for fun or to win. I wanted the bonuses! All the designs are really nice and funny / cute. Cashmio Casino may be a perfect fit for slot fans as it offers a huge selection of the titles powered by Net Entertainment, Microgaming, Quickspin, Genesis Gaming, Lost World Games, Betsoft, NextGen, Leander Games, Yggdrasil, Red Tiger Gaming, Geco Gaming, 2by2 Gaming, Thunderkick, Rabcat, Big Time Gaming, ELK Studios, Play’n GO, Aristocrat, WMS, Evolution Gaming, Skillzzgaming and Triple Edge Studios. Cashmio offers a solid game library with more than 1,300 games, from slot machines to table games and Live dealer. Because there are so many games, the Cashmio team added a great filtering tool that will allow you to find the game you are looking for, if you know the tittle or provider. You can also filter games by theme and mark them as favourites. Find you game: Game Filters! Between so many games, you should find the ones that provide an edge to win. Higher payouts are the way to go, so we took the time to search for the top 10 loosest slots available at this venue. Cheers! 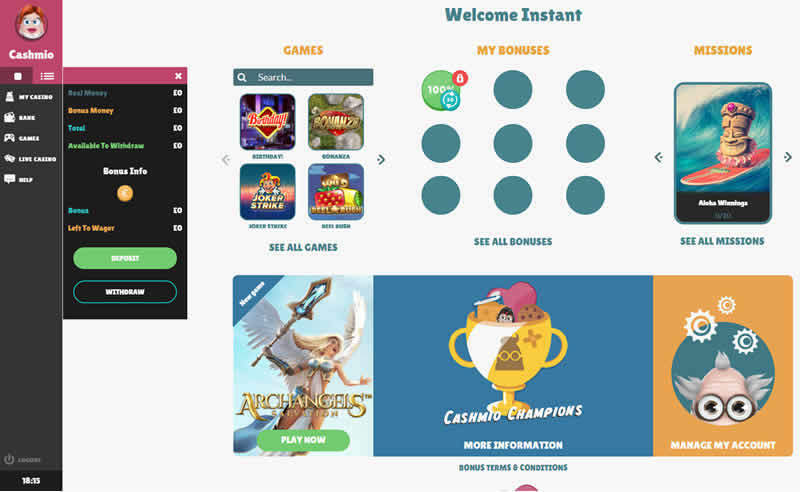 This casino site is fully optimized for mobile devices and since you don’t need to download any client, you can play directly from your browser on instant play. The mobile casino version runs smoothly on any iOs, Android and windows devices from your smartphone or tablet. The casino representatives are friendly and knowledgeable and answer fast. The problem here is that the fastest way to contact them is via Live chat, which is available from 8:00 to 23:00 CET. While I’m really happy with the service I received when contacting the support team, I just wish they would be available 24/7. Hopefully Cashmio will extend support working hours at some point. Live Chat – 8:00 to 23:00 CET. From the first moment, reviewing this casino was pure fun. I liked the design and utilities I found at Cashmio, from the simple sign up form up to the useful game filter. This gambling venue works with the latest technology and SSL encryption, ensuring the safety of your data and transactions. If you use the correct payment methods, you will receive your casino earnings instantly, even during weekends. Support works around the clock providing solutions without giving you a runaround. Sadly, players can only receive assistance from 8 to 23hs CET so if you had an issue during a late session, you will have to wait until the next day for an answer. In terms of bonuses, there are many country restrictions. The truth is that players from only 8 countries are entitled to participate in promotions. If you live in UK or in the Scandinavian region, you are good to go. If you don’t, you will still be able to participate in daily quests, but forget about the welcome bonus or free spins. All in all, this is a great venue with a solid offer, between the top rated brands available to UK and other European players. If you like gamified casinos, this may be the right place for you. Because you can play more than 1,300 games from a variety of software providers and enjoy same day payouts. This is an amazing casino brand that doesn’t have significant complaints in any gambling forum. That’s quite impressive right? More than 1,300 games available + Live dealer. Licensed by the MGA + UKGC. Independently Monitored. Works with RNG. Instant play + Mobile friendly. Limited customer support (hours + contact methods). Bonus restricted in some regions. Check T&Cs for more info.